Studying for a licensing exam or a class with significant content on infectious diseases pharmacotherapy? 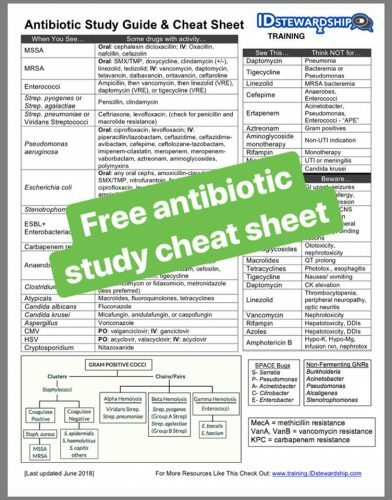 IDstewardship’s study guide provides you with a free study tool like none other. Content is developed and provided by an expert in antimicrobial pharmacotherapy and is meant to identify information that you are likely to encounter on an exam. KEY POINTS: These are meant to be the most important things to know about the drug. Identification of when the drug should be avoided or may be considered for use is the focus of this section. You will find things like which bacteria an antibiotic lacks coverage for, especially important adverse effects or drug interactions, and times when the drug is commonly used in clinical practice. RESOURCES: If you would like to learn more about a particular drug, this section provides links to reliable resources. The resources provided are selected for their clinical relevance and/or substantial discussion provided regarding the use of a given drug. PHOTOS: Photographs are meant to assist visual learners. Becoming familiar with how a product comes can assist in remembering things like what common doses are and what formulations are available. Infectious diseases pharmacotherapy is a challenging topic with which many people understandably struggle. The following tips are meant to assist learners in their approach to mastering the content. There are a number of ways to go about making a study plan and you should do what is best for your learning style. In making your plan you should consider things like: (1) The content that will be on each quiz, test or exam; (2) major life events coming up; (3) responsibilities with other coursework; (4) what location(s) can be used for studying; and (5) who you want to study with. I recommend that you employ several different study techniques, which get more advanced as you go from learning to define certain terms (which can be done with flashcards) up through learning how to compose your own plan based on a given case (which may be good to do in a study group). It is important to go through the basics and not skip ahead to study groups too quickly or you may find yourself lacking in the basics. Many times we make a great plan and then it goes out the window soon after. To help you stick to your study plan, you can consider using checkpoint incentives or consequences. Personally, guilt works well for me. I make a calendar and then for each day I study I put an “x” on that day. The calendar remains in a place that I see it each day and a lack of marked days will be enough to make me feel guilty and get my act together. We all have our natural talents and learn differently, to a degree. Recognize that just because someone you want to study with is doing things one way, that does not always mean you should follow suit and that is the best way for you to learn. This is a time to be selfish, because the goal is for YOU to learn. They say “shoot for the moon and you will land amongst the stars.” I suggest that you shoot for an A grade every time. The less you miss by the better you will do. People in your course have to get to the same point. Listen and learn from others around you regarding what strategies seem to work. Also, talk to people who took the course before and see what they found to be particularly useful. Remember that just because your study plans worked for basic courses like Biology 101, that does not mean they will work for higher-level content provided in a pharmacotherapy course. I know that people just want to know what will be on the exam. The key points provided here is intended to give you that information. You will not find all the answers to your questions here, but there is a very good chance the key points your professor wants you to know match the content provided here. In addition, here is a simple bugs & drugs study table for you! Be sure to check back soon for new content!